The Goshen College men’s basketball team officially begins practice on Sunday, after spending several weeks focusing on physical conditioning. Neal Young, who became the men’s coach last April, said players were tested for the mile run, court sprints and weightlifting when they came back from the summer; they’ll be tested again in advance of the first practice (he hopes the team averages under 6 minutes for the mile). Young, 28, who served as an assistant coach at Goshen College from 2008 to 2011, knows the level of competiton his team of 12 will face. He inherited the program from Gary Chupp, whose team finished 8-21 overall and 1-17 in Crossroads League play last season. But Young is also determined, in the most personal of ways. Only two months after he was appointed head coach and two days after he and his wife, Maggie, moved to Goshen, on June 2, Young was diagnosed with T-cell lymphoblastic lymphoma. Doctors found a tumor the size of a baseball in his chest. By Wednesday, he was back on campus, mananging the team. So during the first weeks of the basketball season, he will not be present in all the varsity practices, but he said he has full confidence in his assistant coaches, Brandon Lokken and Mike Hunter. For the past couple of weeks, Young said, he has been exercising again: walking 15 minutes, working out on the elliptical machine for another 15 minutes, a quick circuit of light lifting. Tim Demant, the athletic director at Goshen College, said that Young brings “an outstanding professional background” to the position. As an undergraduate, Young played for the Anderson University, where he received his degree in secondary education. He also received a master’s degree in organizational leadership at Lewis University. 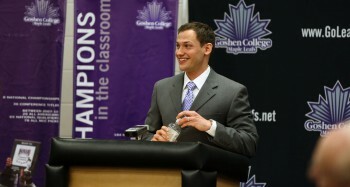 Young is the 14th head coach of the Goshen College basketball program. His first coaching opportunity was in Anderson Highland High School, where he developed his knowledge of the sport as the freshmen coach and as the assistant coach of the varsity team. He then went to Goshen College to become the assistant coach in 2008. That year, the team set a Goshen College record for most conference wins, nine, during a season. After three seasons at Goshen, he signed as an assistant for two years with Lewis University, an NCAA Division II university in Illinois. There, he helped to coach a team that tallied 36 victories. The school also reached the NCAA Division II national tournament during Young’s time there. One of the themes for the season is appreciation. To remind his players of the chance they’ve been given, Young keeps a sign on his door listing the number of players who “contacted us because they want to be a part of this program.” On Wednesday, he erased 93 and wrote in 97.